St. Patrick’s Day will be here next week, and Shamrock Smiley Cookies have sprung up here at Eat’n Park. The abundance of green is a little reminder that spring is right around the corner! St. Patrick was a Christian missionary who came to be recognized as the patron saint of Ireland. Born in Britain, he was captured by Irish raiders when he was a child, and was taken to Ireland as a slave. After his escape years later, he decided to return to Ireland to bring Christianity to the people there. St. Patrick is believed to have died on March 17 around 460 A.D., which is why St. Patrick’s Day is celebrated on the 17th. What does the Shamrock have to do with St. Patrick? The Shamrock is a three-leaved clover, and legend has it that St. Patrick used the formation of the leaves to explain Christianity’s Holy Trinity. Why are Shamrocks considered lucky?Probably because the three-leaved Shamrock is often confused with the rarer four-leaved clover. The four-leaved clover is considered lucky because the odds of finding one in a field of Shamrocks are 10,000 to 1. So, there you have it! Interested in more info on St. Patrick’s Day? Check out the St. Patty’s pages at History.com: http://www.history.com/topics/who-was-saint-patrick. 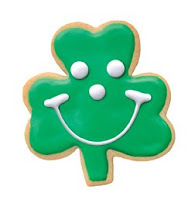 And if you’re feeling lucky, download our “Luck O’ the Smilish” wallpaper featuring our Shamrock Smiley Cookies – it will certainly get your Irish eyes a smilin’! Click here to download.